The blue tones in this iris are so refreshing. Nice work on the glass vase. I think the photo turned out really nice, but I do know what you mean when you say that the photo does not always do the painting justice. 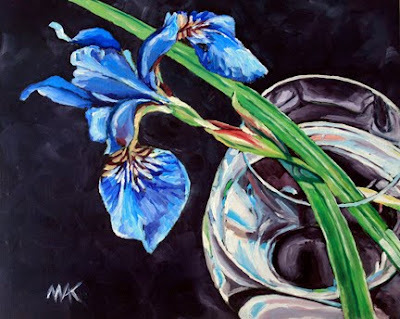 It looks great online too Mary Anne...painting glass is fun! Great painting. The glass turned out really well. Love the bold blue of the flower.